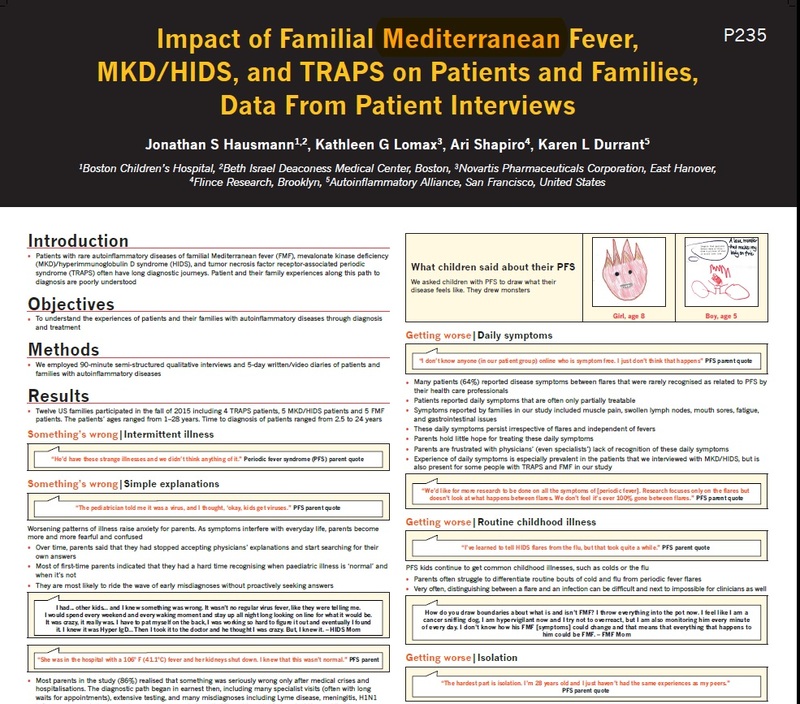 This 2016 study looked at how familial Mediterarrean fever (FMF), hyperimmunoglobulinemia D with periodic fever syndrome (HIDS), and tumor necrosis factor-associated periodic fever syndrome (TRAPS) affects patients’ lives and their family’s lives. We invited a sample of patients with these diseases to participate in the study, which consisted of an interview led by a medical anthropologist, journaling, and creative artwork projects to get a full perspective of the patient and family experience from the period of being undiagnosed, seeking a diagnosis, and during diagnosis and treatment. 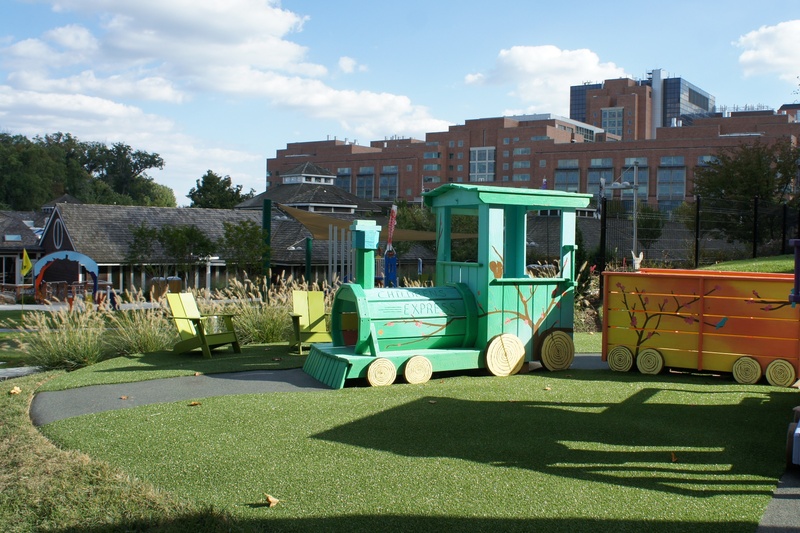 In addition, the study was designed to collect more details on what concerns or unmet needs were still being noted by patients and their families. Rheumatologist Dr. Hausmann and Autoinflammatory Alliance President Karen Durrant, RN, BSN were two of the contributing editors. It was presented as a poster presentation by Autoinflammatory Alliance President Karen Durrant at PReS 2016 in Genoa, Italy. The Pediatric Rheumatology European Society (PreS) is the leading medical society for pediatric rheumatology in Europe and has a large global outreach. There is a large focus on autoinflammatory diseases at this conference and a concurrent meeting of the European Network for Children with Arthritis (ENCA) that board member Saskya Appelman Angevare attended to represent the Autoinflammatory Alliance patient communities in Europe, especially for The Netherlands. 64% of patients reported having symptoms between flares. This was most common in the HIDS patients. Most report struggles with getting a diagnosis, and a lack of support from schools, family, and friends. Although getting a diagnosis provides a sense of relief to know what it is, it often leads to more questions and uncertainty. 86% report realizing something was seriously wrong after a medical crisis and hospitalization. Most are misdiagnosed before getting a correct diagnosis. Misdiagnoses included lyme disease, meningitis, flu, leukemia, lymphoma, bone cancer, Crohn’s disease, and atypical Kawasaki’s disease. Artwork demonstrating the patient’s idea of what was going on inside their body with disease flares, and how to explain the inflammation in the body. 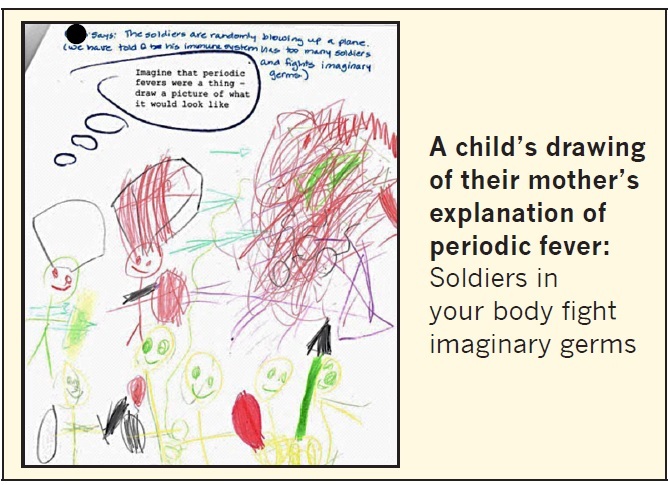 Most children drew pictures of monsters to represent their disease. I had other kids and I knew something was wrong. It wasn’t no regular virus fever, like they were telling me. I would spend every weekend and every waking moment and stay up all night long looking online for what it would be. She was in the hospital with a 106° F fever (41.1º C) fever and her kidneys shut down. I knew that this wasn’t normal. The hardest part is isolation. I’m 28 years old and I just haven’t had the same experiences as my peers. I had to fight for a diagnosis. I know that sounds insane, and when I think about it, well yeah, it was insane. And they were telling me I was crazy. It went on like that for years, and I kept going to different hospitals. I couldn’t get anyone to believe me. 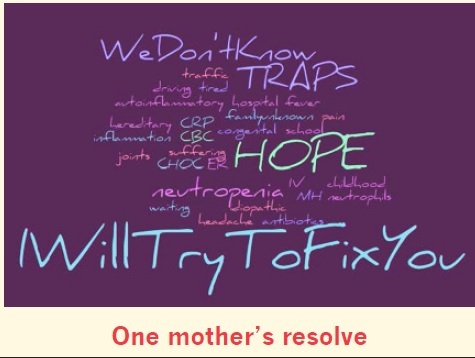 I thought that the diagnosis would bring us some closure, but in a way a diagnosis is where the real story started. 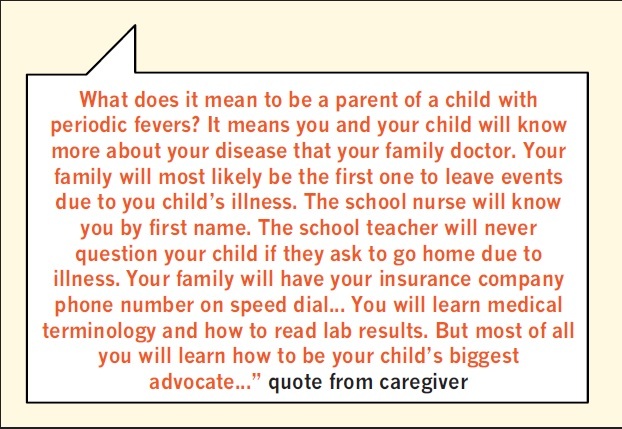 We’d like more research to be done on all the symptoms of [periodic fever]. Research focuses only on the flares but doesn’t look at what happens between flares. We don’t feel it’s ever 100% gone between flares. The hardest part about this disease is the difficulty in predicting what my day is going to look like. I can set all the plans in the world, but this disease can steal it away. Patients with autoinflammatory diseases often encounter long diagnostic delays, causing significant stress and confusion for the patient and their families. Distrust of the medical establishment may persist even after diagnosis. Loss of normalcy is a core tragedy for many families. Confusion and uncertainty continue to mark these families’ lives, even after diagnosis. 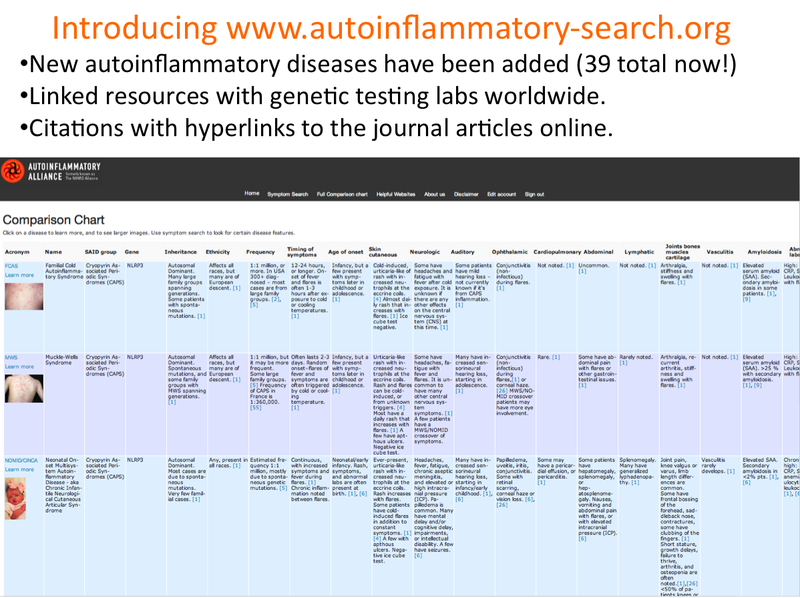 Initiatives that improve the speed and accuracy of diagnosis, standards of care and treatment, more consistent, comprehensive patient education, and support patients and their families with these lifelong, chronic diseases have the potential to greatly improve the lives of patients with autoinflammatory diseases. This research study was supported by Novartis Pharmaceuticals, Inc. and was a collaboration with a few doctors and other medical professionals. We are pleased to have been a part of this project, and feel that there were some very important findings that came to light with this study, especially the information on patients having more challenges with symptoms between disease flares, as this is an issue that we hear about in our patient community that has not been well documented in most publications. Click the graphic to view the full PDF of the poster. Click here to view the full PDF of this poster.